Tradeshow Displays web design || Website design for portable display company. 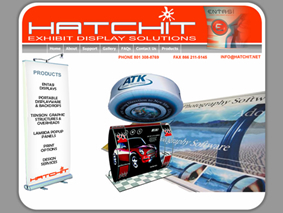 As a new player in the highly graphic exhibit display arena - Hatchit Displays needed to "splash" onto the scene with a striking brand. We set the stage with a logo and bright color palette so the first impression is marked.